Timothy Rixstine talks about the impact of Heartland at the McLean County Chamber of Commerce's Business before Hours. Rep. Dan Brady mingles with attendees at Business before Hours. 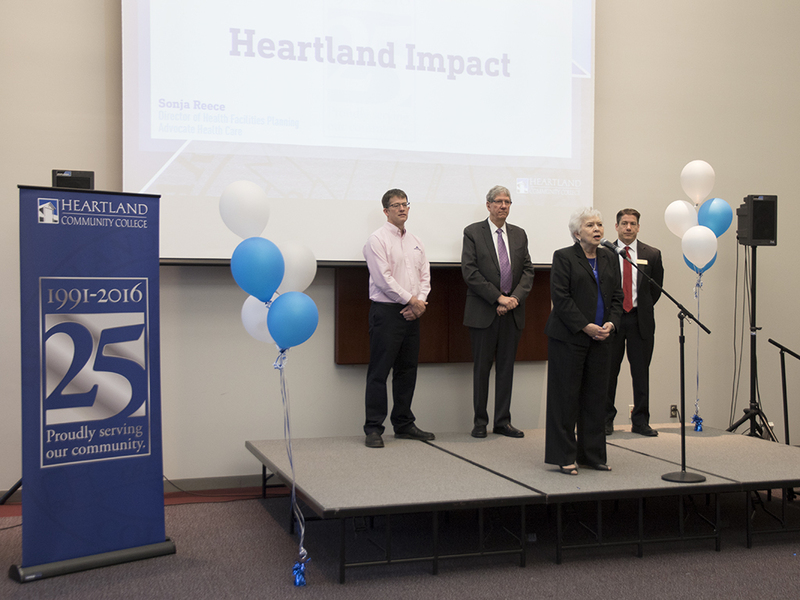 Sonja Reece of Advocate Bromenn talks about her memories of Heartland's growth. 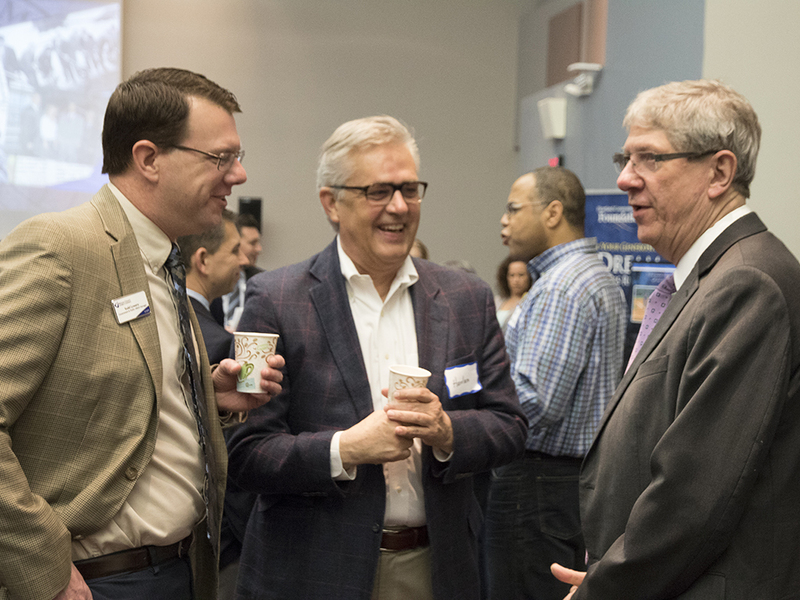 Todd Lowery (Chamber of Commerce) and Harlan Geiser (retired from Integrity Solutions) talk with Town of Normal Mayor Chris Koos. 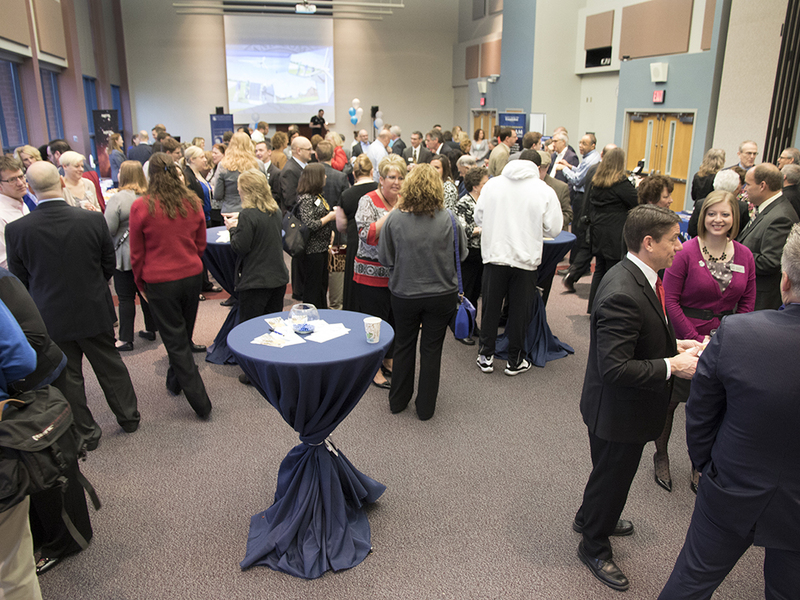 It was a full house at HCC's 25th anniversary recognition during Business before Hours. Almost everyone in the crowd had a connection to Heartland Community College. Before there was a café, library or game room, HCC students passed time between classes in the parking lot of Landmark Mall where the College’s first classes were held in 1991. “There was nowhere to go and you didn’t want to lose your parking spot, so most students just waited in their cars,” said Janet Hill-Lakin, executive director of governmental relations and long-time HCC employee. When driving down Raab Road in Normal, you can see the school has come a long way in its 25-year history. HCC alum Donald Wiggins Jr. remembers when Heartland was in Towanda Plaza and is amazed at the College’s growth. “Not only has it grown in size, but there are more opportunities available for students,” Wiggins said. Starting a college is no easy feat. It took many knowledgeable and experienced people as well as an invested board of trustees. Fortunately, that’s exactly what Heartland had in place in 1990 when the Illinois Community College Board established HCC’s district (540). After swift accreditation, Heartland focused on offering core transfer classes to its first 811 students, holding the classes all over the community in churches, trailers and other available space. Once instituted, Heartland’s enrollment saw double digit growth year after year. Soon the College established satellite campuses in Lincoln and Pontiac to serve the other majorities of the district. Given the initial growth, the board of trustees saw the need for a permanent campus. 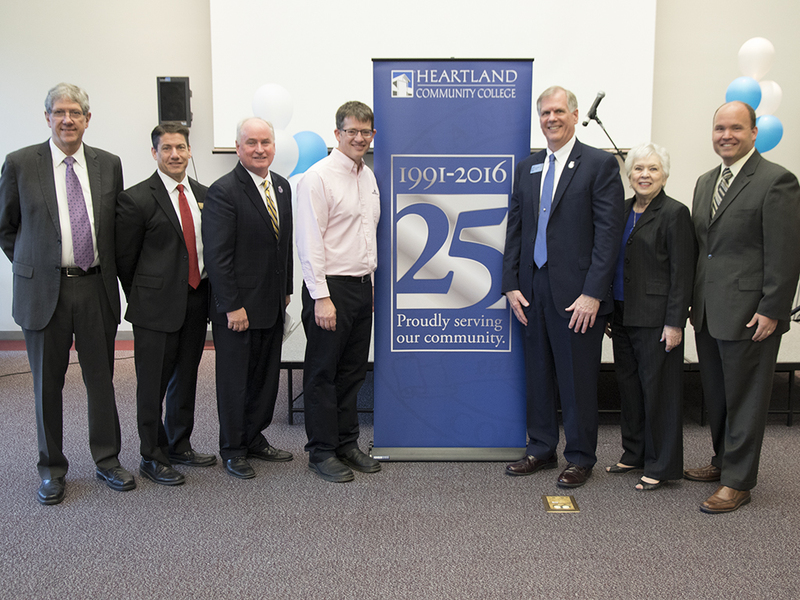 Plans for construction started forming in 1996 and by 2000, Heartland had a brick and mortar campus in Normal. With the establishment of a permanent campus, not only did enrollment grow, but the age of students trended downwards. That prompted College leaders to look at the importance of student life and ensure Heartland students received a well-rounded experience. “We wanted our students to have the same kind of college experience they would get anywhere else,” said Widmer. After working with and surveying students, the College was able to determine their interests and pursued a student life program. Activities today include more than 30 clubs and organizations as well as a game room, fitness and recreation center and an athletics program. On the academic side, Heartland’s programs have also provided students a valuable learning experience, and they’ve come a long way since offering those initial core classes back in 1991. HCC currently has more than 70 areas of study plus numerous non-credit, continuing education and youth enrichment programs. In order for students to access the College’s learning opportunities, Heartland is diligent about keeping costs as reasonable as possible. 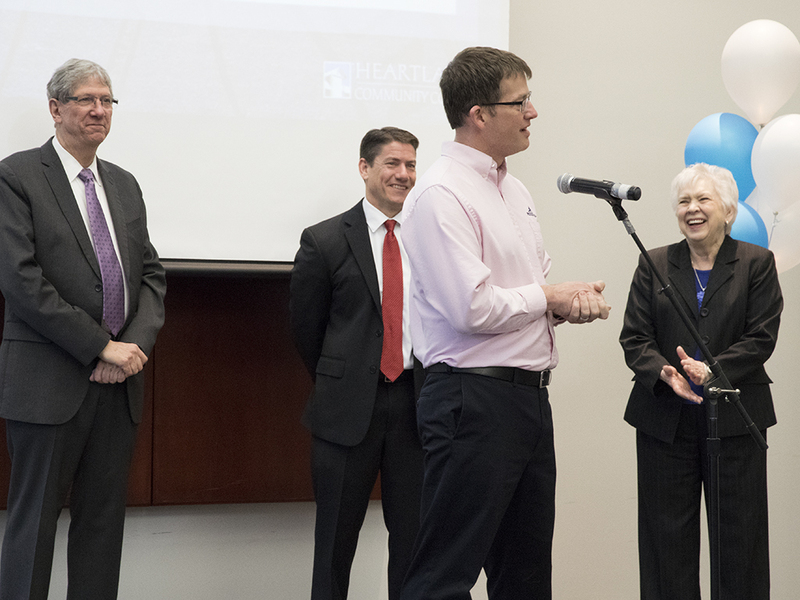 To help students with educational costs, the Heartland Foundation was established in 1992 “to support access and excellence at HCC.” Since its start, the Foundation has assisted more than 1,600 students and offered more than $1.5 million in financial support. 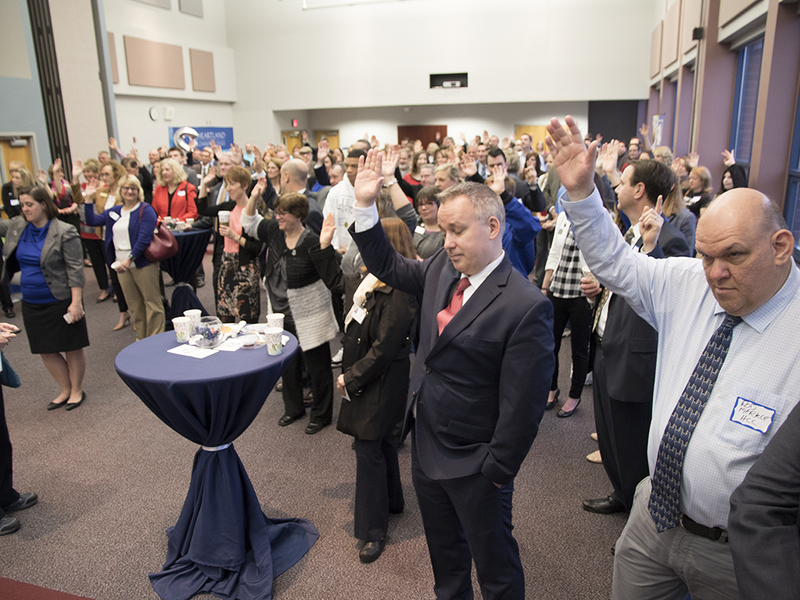 Partnerships helped shape what the College has been and what it will be. Responding to community needs is an institutional commitment. 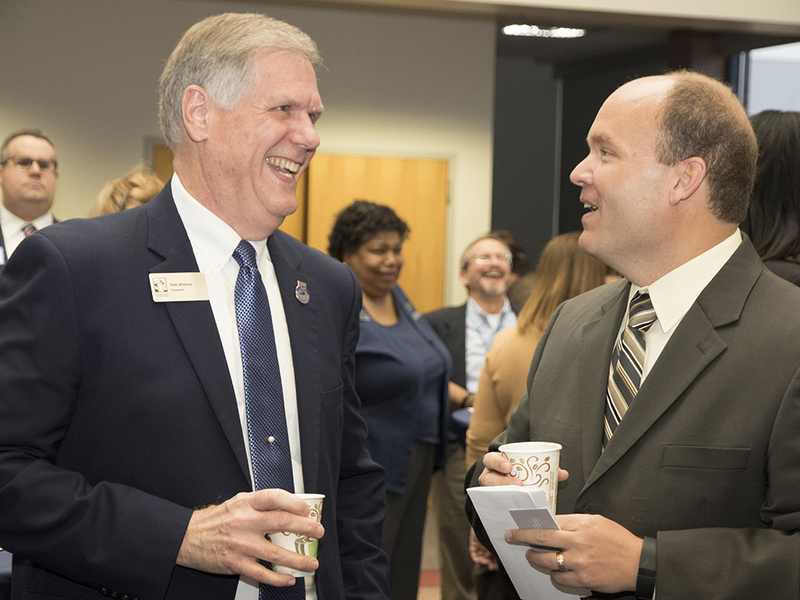 The College regularly partners with local community and social agencies in an effort to enhance the quality of life for area residents and students. 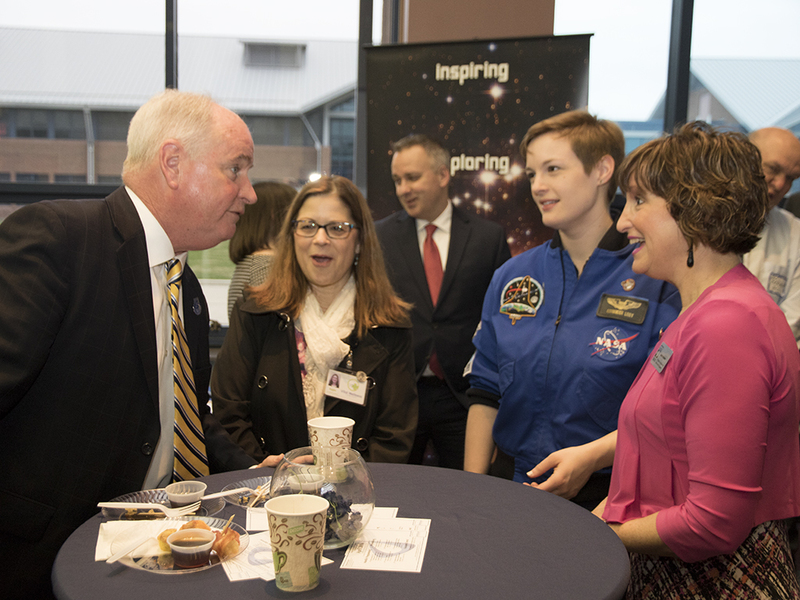 When the community was at risk of losing the Challenger Learning Center, the College worked with the Prairie Aviation Board to transition the center to its Normal campus. Not only did this preserve the center, but it allowed the program to grow. When the College decided to invest in student athletics and facilities, they were able to partner with community leaders to bring a professional baseball team to the community and build a state-of-the-art athletics facility. Partnerships have also shaped programs of study at the College, especially career/technical programs. Those areas are often developed out of community needs. Most recently, the College implemented a Physical Therapist Assistant program after the medical community indicated it was a growing career opportunity.